1. 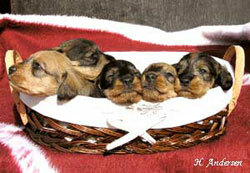 Following up a diet suitable for their growth by feeding puppies with wholesome and balanced food. Our experience persuaded us to accustom dachshunds to dry food, the best choice for their health; moreover, dry food is more practical for owners who like to go around with their “new-friend”. Anyway, sometimes it is possible replacing the usual diet with half-cooked mince mingled to rise, pasta, wet feeds or cans even if, by now, it is proved that the less you change your dog’s food habits the less he gets digestive and bowel upset. During the first 8-12 months, we suggest you to feed your dachshund with puppy dry food (rich in integrator — calcium, vitamins, etc. — so that, except for extraordinary cases, they don’t need to be integrated) then with grown-up and senior dry food. For making it more desirable, we usually dampen dry food and add some titbits of ham, cheese, meat, etc. A great variety of brands are available and you have to be aware of your choice following veterinary’s advices and your dachshund preferences. We use Royal Canin. On the packaging is indicated the portion of food in accordance with dog’s weight. Never forget to leave a fresh water bowl available for your dachshund. 2. Your puppy partly or completely vaccinated, according to his age, needs a reliable veterinary looking after him in renewing all the essential vaccinations during the first months, every year and all over his life. It is of the utmost importance to follow veterinary’s advices about schedule of vaccinations and issue them before getting your puppy in contact with risky environments or unknown dogs. We also advise you to vaccinate your puppy against rabies and follow up an annual filarial prophylaxis, it will make you safer in case of travelling or trips in risky environments. Thanks to small devices (pipettes, vaporizers, anti-parasite collars, etc.) 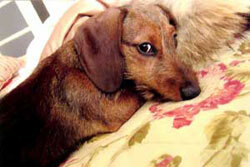 you will have a dachshund with thick and glossy coat prevented from fleas, ticks and parasites. Obviously, it is of the utmost importance following doses and time prescriptions. In the end, don’t forget to ask your veterinary about the serious problem of leishmaniosis. 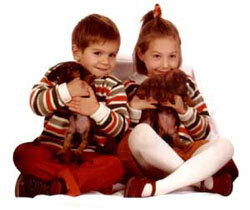 If you like getting in touch with us, we will be glad to apply you to our reliable veterinaries. 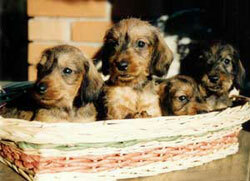 3.a First of all, prevent your puppy from jumps, steps and stairs till he reaches full growth (one year old). Don’t lift him up keeping his forelegs, but put him always up by the scruff of the neck or below the belly. Don’t forget that dachshunds are small-sized hunting dogs, they like slipping into every hole to browse; this compelled you to put wire nets on balcony parapets and on French windows. At last, never use harnesses only leashes and collars, better if half-choke strengthen them month by month. All these advices help you to have an up-grown dachshund straight on his forelegs, endowed with a firm and stable, healthy back. 3.b The dachshund you choose is a wirehaired one, this implies a stripping toilet one, two or three times a year, in accordance with the quality of his coat. We will be glad to suggest you how often his stripping must be done in his growing up, anyway, you will shortly and easily find out the right time. Wirehaired dachshunds don’t loose hair, if correctly stripped, and don’t require frequent washings (except for cleaning the beard with a wet cloth after every meal and feet and belly every now and then). 3.c The happiest dog is the one who can live merrily every adventure together with his owner. In order to simplify his managing, we advise you to buy and use a kennel since he is a puppy (size 1 or 2 for Miniature or Kaninchen, size 3 for Standard). The sooner your puppy is used to stay in the kennel the easier you can bring him to restaurants, hotels, into cars, trains or planes; he will always be glad to stay with you. If he hasn’t got the habit, the first time you need to bring him along, he will suffer a lot (and we grant that sooner or later it will happen). 3.d A kennel can also be useful in case of a beauty exhibition or a work trial. After his first birthday, every dachshund has to take part in a beauty exhibition for being attested in size (according to the chest measurement, the dog will be included in one of the three sizes: Kaninchen, Miniature or Standard), and being enable to breed. We are at your complete disposal for any suggestion (about health, building, toilet, etc.) and we will enjoy ourselves in looking at your puppies whenever we have the chance.